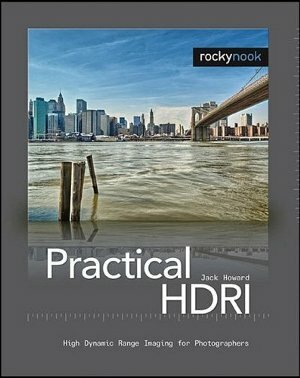 Practical HDRI by Jack Howard (Rocky Nook publishing) is a no-nonsense guide to high dynamic range imaging (HDRI). Read the rest of the review and find out how you can get a free copy of this book. You’ve seen the photos. But hopefully you haven’t let the abundance of bad examples turn you off to HDRI in general—it is a powerful technique that can help you create stunning images that can’t be captured any other way. The introduction lays a solid foundation for understanding HDRI and 8 bit vs 32 bit color spaces. It’s good information and I recommend reading it if you are serious about improving your craft… but if color space geekery makes your head swim, you could safely skip ahead to other topics. Chapters 1-3 focus on gear and composition techniques with a bias towards HDRI. For example, the author talks about basics like shutter speed and lenses but always in the context of how those choices affect your images. But chapter 4 is where things really start to get interesting. In this chapter, the author gives practical advice for actually capturing the basic images necessary for HDRI in the field. He covers metering, bracketing, manual mode, RAW and JPG, file organization and, importantly, how to recognize HDRI opportunities and non-oppoertunities. The rest of the book deals with the actual business of using software to generate HDR images and gives detailed instructions for using Adobe Photoshop CS3, Photomatix Pro 3.0, FDRTools Advanced 2.2, and Dynamic Photo HDR 3.x (software not included, free trials available for download from the vendors). These four chapters are absolutely packed with useful information. A bit of a warning: HDRI is a technical, often tedious, and time consuming process. Although the author strives to shield the reader from too much camera and software shenanigans (and he does a pretty good job, too—no one is going to have a nerdgasm from reading this book), the subject is inherently technical and you can only go so far without at least a willingness to try and bask in the geekiness of it all. Definitely recommended for anyone interested in HDRI from absolute beginners to folks who have a few HDR images under their belts and would like some tips for improvement.